Valentine’s Day may be over a month away but I’m already excited for all things sweet! Now don’t get me wrong – I do love chocolate – but for Valentine’s Day favors I really love the non-edible treats. For this month’s free printable, I wanted to design something fun for girls to hand out to friends. This is a great idea that all ages will love! These toe-tally adorable freebies are perfect for mini pedicure kits with polish, cotton balls, nail files or nail stickers. I’m TOE-tally Glad We’re Friends! These free printables come in both circles and bag toppers. The circles fit perfectly over mason jar lids for a cute party favor and the bag tags are great over sandwich bags or even attached to small paper gift bags. 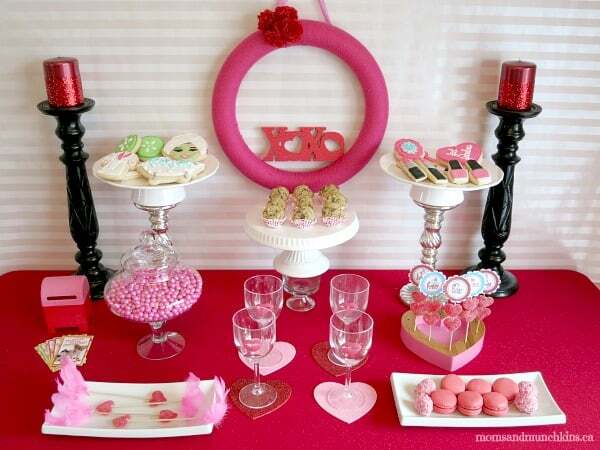 Thinking of throwing a Valentine’s Day party this year? Check out this Valentine’s Day Spa Party from last year with FREE printable party supplies by Alyssa of Just A Little Sparkle. These TOE-tally fun Valentine’s Day printables are available for FREE for our monthly newsletter subscribers! Signing up is free & easy – we have over 5200 subscribers! Simply enter your email address, confirm your subscription, and you’ll be directed to a page with a link to the freebies page along with the secret password. This link and password will also be repeated in each of the monthly newsletters. Visit our Valentine’s Day page for even more free printables, Valentine’s Day games, party ideas, sweet treats and more! Hi Debbie! I sent you an email but I forgot to update you here. Sorry about that! Please let me know if you didn’t receive the email. Thank you! Signed up for your monthly newsletter & cannot download the “toe-tally” valentine day labels. Hi Wendi! I’ve sent you an email a couple of weeks ago with a link. Please let me know if you didn’t receive it. How do I get the free printables? The link provided isn’t working. Any chance you can email them to me?